The Nominated Housemates had a lot to think about as they got their hair done this morning, in preparation for tonight's Live Eviction Show. Early Sunday morning's in the Big Brother House are never fun. After all, the ever present threat of looming Eviction puts a damper on everyone's spirits. 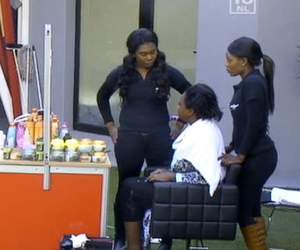 This morning was no different as the Nominated Housemates filed out of the House to get their hair done by professional hair stylists, in the garden. Natasha and Pokello were the first on the hairdresser’s chairs and the two yawned through their respective sessions like professionals. The two seemed to have a lot on their minds and we can bet our bottom dollar that all that tension was courtesy of the Evictions.